Mui Ne is one of my favorite destinations in Vietnam, its stunning topography is a testament to the magical prowess of nature. I visited it twice because I felt like I was on a rush the first time I visited in 2012, so when I went back to Vietnam, since it was winter in the northern part, I detoured to the south and revisited Mui Ne. 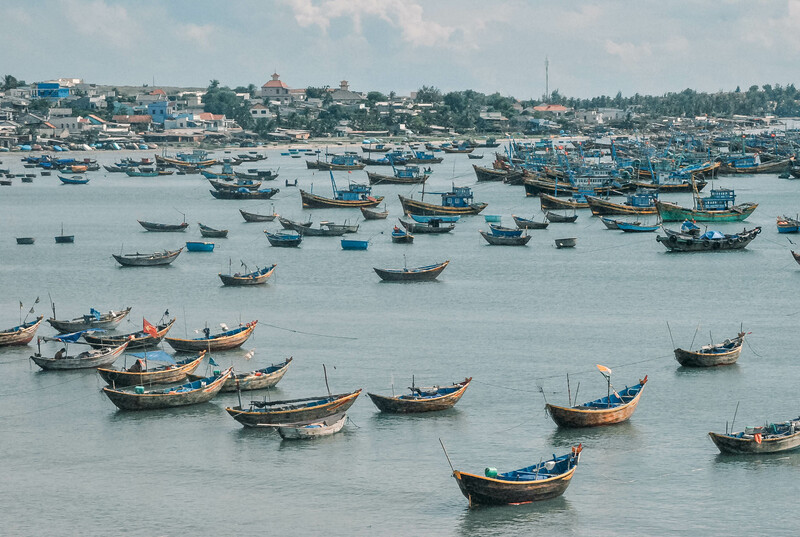 This beauty was an erstwhile fishing village located in Phan Thiet in Binh Thuan province. Today, the once sleepy community is now packed with tourists especially Russian tourists who escape here during winter in Russia. Despite the crowd it brings, Mui Ne still exhibits a laid-back appeal. This place is riddled with natural attractions and water activities. But my favorite thing to do here is eating some of the best fresh seafood in my life by the beach. Good news is, Mui Ne is pretty accessible from Ho Chi Minh City (Saigon), and you can even visit it as a day trip! But I recommend you stay at least a night or two, to soak up its coastal atmosphere. 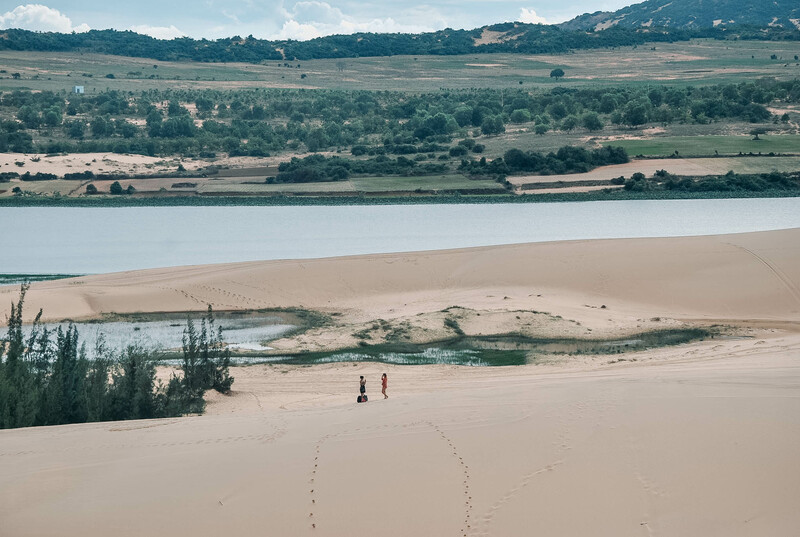 And as always, to help you plan your trip here, I’ve created this Mui Ne Travel Guide Blog with itinerary and budget breakdown. Mui Ne is one of the places in Vietnam that is a year-round destination. But if you ask me, the best months to visit are from October until November and April until May. I can’t remember what month was my first visit, but during my second visit it was late November and the weather is still warm and sunny, unlike in Northern Vietnam, which was already raining and cloudy during that period. Mui Ne, like the rest of Vietnam uses Vietnamese Dong (VND). 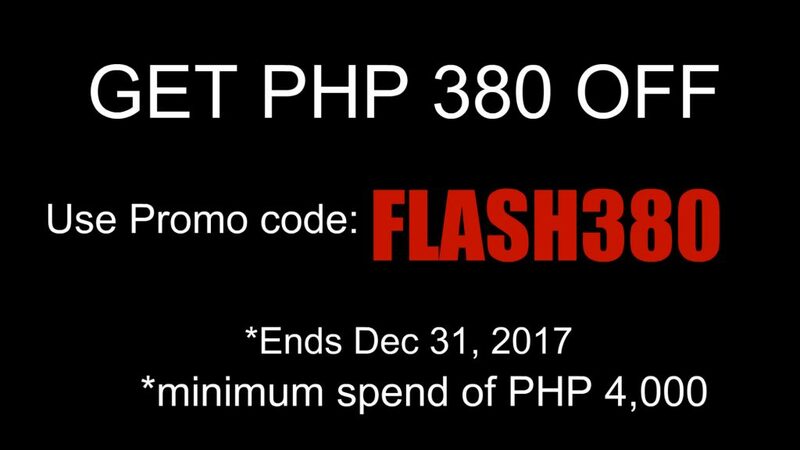 PHP 100 is around VND 45,192.93. So if you are a Filipino and you want to see yourself holding million/s for the first time, exchange at least PHP 3,000 to Vietnamese Dong and you’ll instantly be holding around a million VND. 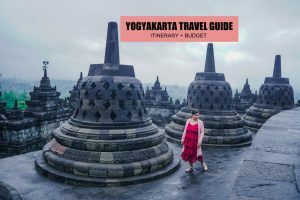 But don’t worry, it may sound like Vietnam is expensive because of their currency, but if you convert their prices to peso, you’ll be surprised at how cheap everything here is – from food to hotels to tours. This is why it’s one of my favorite country backpacking in Southeast Asia. Now if you want to change your money, I suggest doing it in Ho Chi Minh City as the rate is better. Mui Ne has terrible rate exchange. But if you run out of cash, you can always exchange at money changers or your hotel. But bank rates are way better. I remember using an ATM just along the highway sprinkled with resorts near Mui Ne Beach. But again, I strongly advise you to do all your money transactions in Ho Chi Minh City, stack up cash (VND) before going to Mui Ne as the few ATMS here have the tendency to run out of cash. Getting connected online while in Mui Ne is important. If you are arriving in Vietnam via Ho Chi Minh City, you can rent a pocket Wi-Fi or buy a sim card through the links below. You can pick up the pocket Wi-Fi at your hotel in Ho Chi Minh City, Da Nang, Hoi An or Hanoi. The device will be delivered there and you can drop it off at the same hotel when you check out. You can pick up the local sim card at Tan Son Nhat International Airport (Ho Chi Minh City) if you are arriving from 7:00 AM – 7:00 PM. Most resorts and hotels in Mui Ne are concentrated along Mui Ne Beach. Here’s a list of Mui Ne Budget Hotels. I will be writing a more comprehensive list in the future. Step 1. From Manila fly to Ho Chi Minh City. Step 2: Book a ticket and ride an open tour bus to Mui Ne from Ho Chi Minh City. Open tour bus to Mui Ne usually costs VND 130,000 /PHP 291 (USD 6/EURO 5/SGD 8/MYR 24). Travel time is about 5 hours. Several open tour buses leave from Ho Chi Minh City to Mui Ne. You can buy tickets from your hotel/hostel in Ho Chi Minh City or you can go directly to Hanh Tourist Café or Sinh Tourist Café and book a ticket there. You may also book online below. There’s a night bus leaving Ho Chi Minh City around 8:00 PM and arriving in Mui Ne around 1:00 AM. If you decide to ride the night bus, please make sure your hotel knows what time you are arriving so they can open the doors for you. Motorcycles and taxis are available to take you around Mui Ne. The beach is pretty close to the resort area as well as the seafood eateries and restaurants by the beach. There are local buses that can take you the nearby Phan Thiet town, though I haven’t really tried this option. But if you want to maximize your time, I suggest joining a group tour by 4×4 jeep or a motorcycle tour with driver. I availed of the two separate motorcycle tours in Mui Ne. I preferred doing this because I am alone and I like to manage my own time. On my 1st day is the half day tour that includes a visit to the White Sand Dunes, Red Sand Dunes, Fairy Stream and the Fishing Village. On my second day, I availed of the Phan Thiet tour that includes a visit to the Whale Temple, Poshanu Cham Tower, Dragon Fruit Farm, Takou Mountain with Cable Car and Ke Ga Light House. 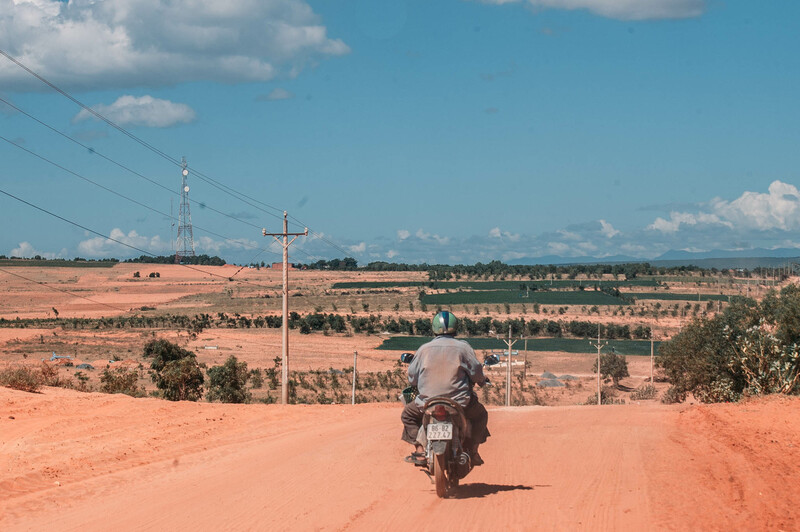 If you have an international driver license or a Vietnamese driver license, you can rent a motorbike to tour Mui Ne. Just be extra careful when driving. If you don’t have a license, don’t risk it, as police are known to apprehend tourists without license, it will cost you more. Tours in Mui ne are pretty cheap anyway and you don’t need to book in advance. You can just walk in at one of the tour operators or inquire from your hostel or hotel. Motorcycle drivers will also approach you to offer tours, discuss the price before proceeding with the tour. How much will it cost to tour Mui Ne? Tours in Mui Ne start at around VND 120, 000 / PHP 270 (USD 5.32 /EURO 5 / SGD 7 / MYR 22) to VND 230,000/PHP (USD 10/EURO 9/SGD 14/MYR 41). I’m talking about the half-day sand dunes tours in Mui Ne. 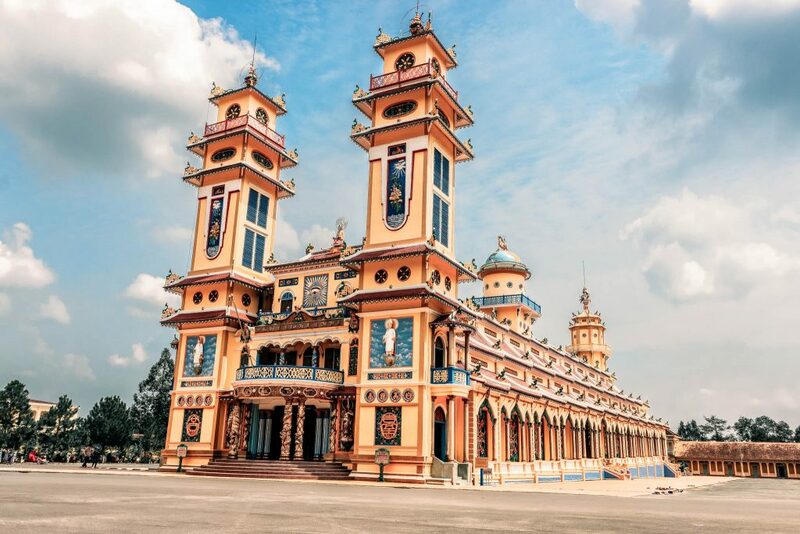 Phan Thiet Tours usually cost higher since it will take an entire day to tour Phan Thiet, so expect to pay anywhere around VND 240,000 / PHP 535 (USD 11 / EURO 9 / SGD 14 / MYR 43) to VND 350,000/PHP 774 (USD 15/EURO 13/SGD 21/MYR 63) or higher. 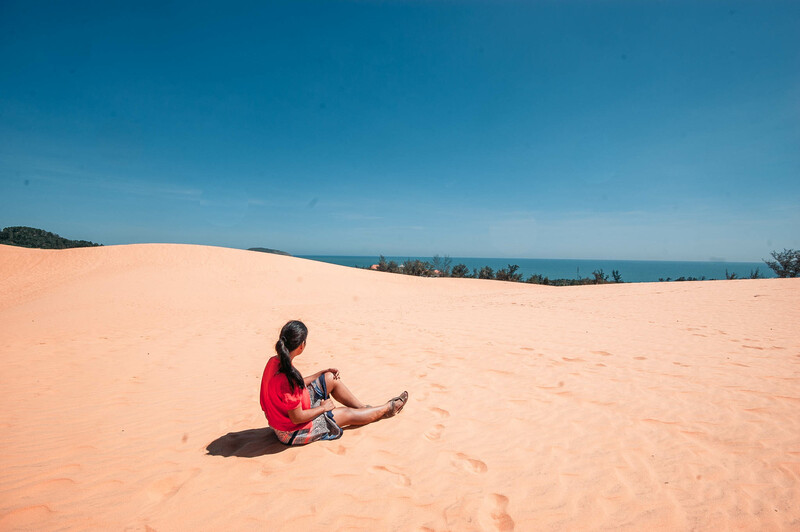 My favorite attraction in Mui Ne is the White Sand Dunes, referred to by the locals as Bang Trang or White Lake. This desert is massive, and some part is sprinkled with pine trees. It was my first time to set foot on a desert but prepare your sunblock as the sun here is extremely unforgiving. Bring water to keep yourself hydrated, but you can also purchase soft drinks and water here. Best to visit early in the morning or late in the afternoon as the sand can get extremely hot. Tours to the Mui Ne Sand Dunes usually start at 5:00 AM for the sunrise and 2:00 PM in time for the sunset. Visitors can also rent quad bike here for VND 200,000 /PHP 443 (USD 9/EURO 7.46/SGD 12/MYR 36), good for two. I didn’t get to try this though. I think it’s more fun to do this when you’re traveling with friends. 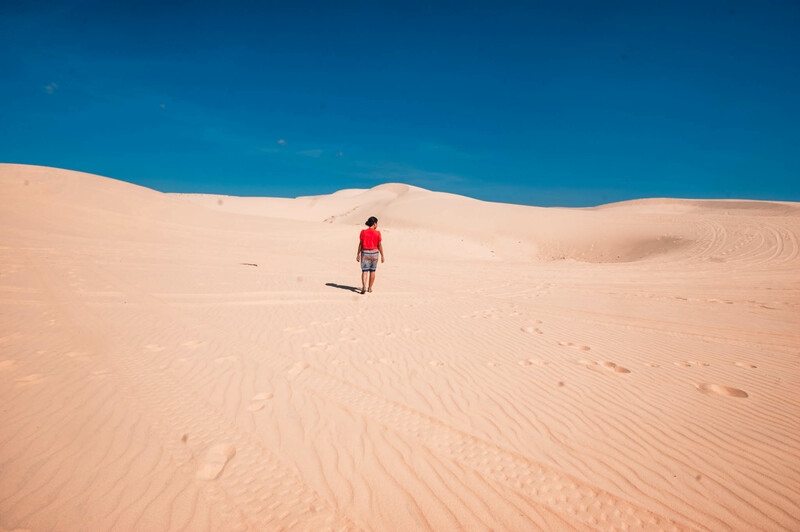 I preferred just roaming around despite the scorching heat of the sun and taking photos of the scenery and other tourists having fun riding on the sands. 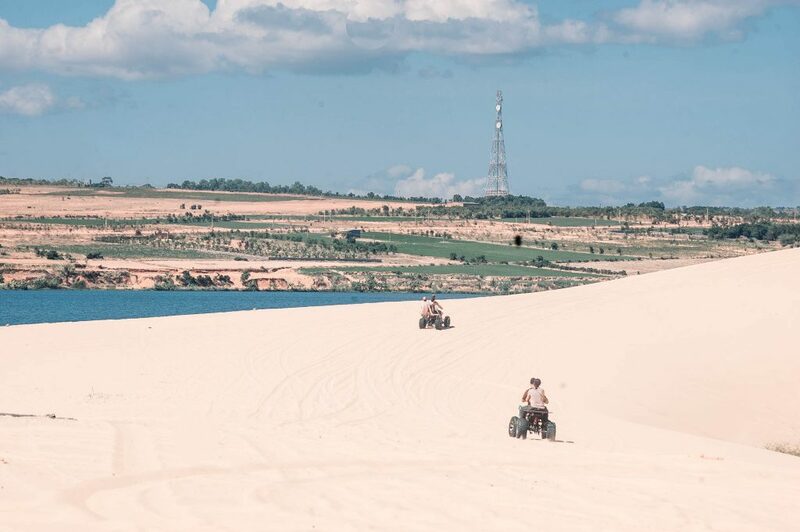 Don’t miss this White Sand Dunes when you’re in Mui Ne. The Mui Ne Red Sand Dunes is smaller compared to the White Sand Dunes, but it is equally charming especially at sunset. It is easily accessible as it is located just along the highway. Upon arriving here, kids will mostly offer sand sledding to you for VND 20,000/PHP 33.19 (USD 0.88/EURO 0.75 /SGD 1.19 /MYR 4). I find it nice to just walk around here, at the highest point you can actually see the blue sea nearby. Eateries and stores are sprinkled along the road fronting the sand dunes. You can buy cold drinks here to avoid being hydrated. 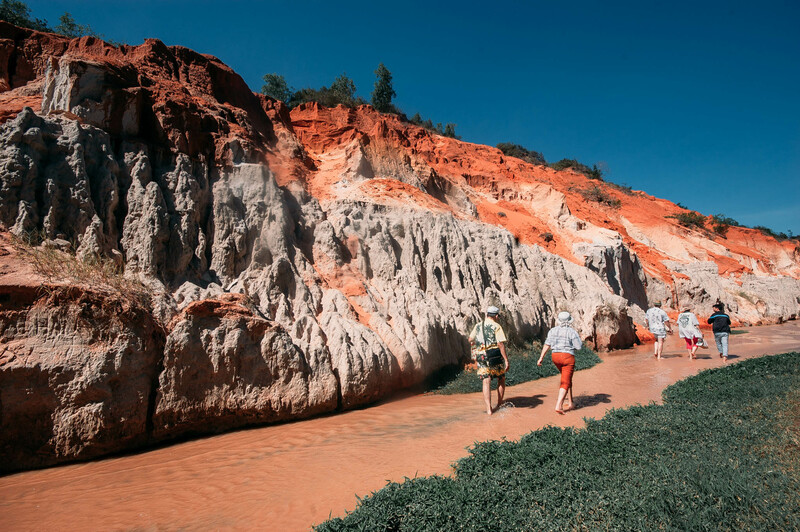 Another interesting place to visit in Mui Ne, which is usually part of the typical Mui Ne half day tour is the Fairy Stream. This soft red creek is made possible by the limestone and clay particles from the rock formations that fringes its bank. Remove your shoes or sandals and walk along the ankle-deep water that leads to a small waterfall. 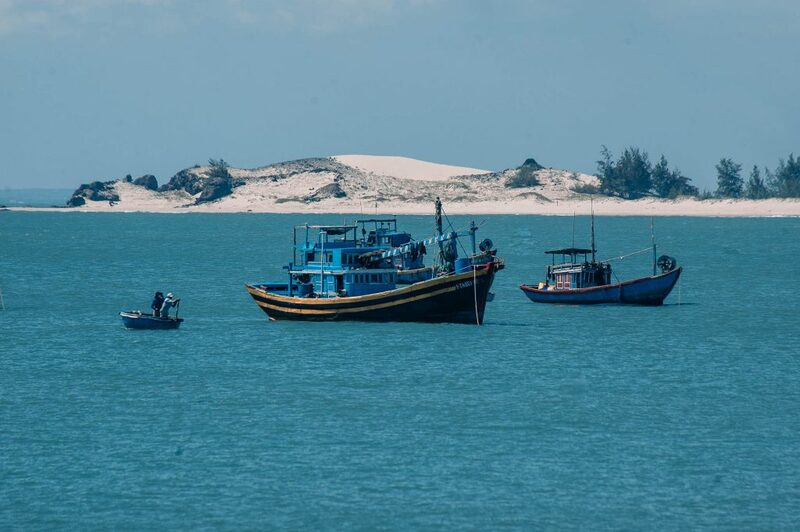 Part of the half day tour of Mui Ne that includes a visit to the White Sand Dunes and Red Sand Dunes is a quick visit to Mui Ne Fishing Village. 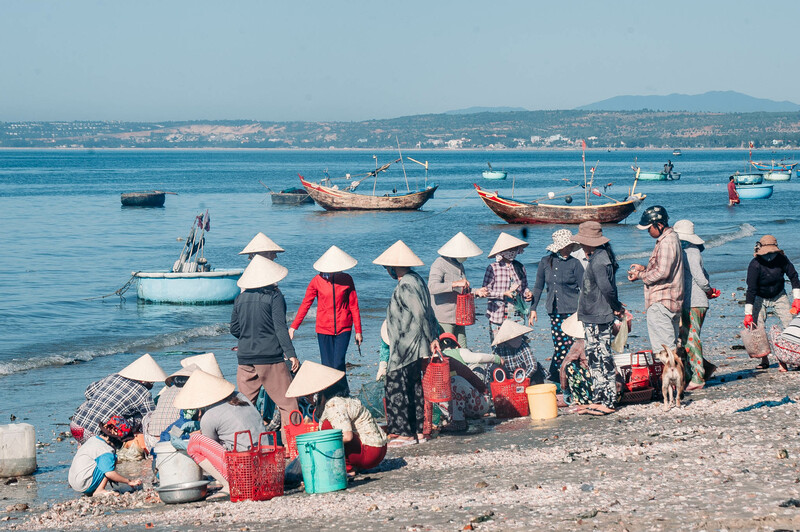 It is one of my favorite spot in Mui Ne as visitors can witness local life and buy fresh seafood. 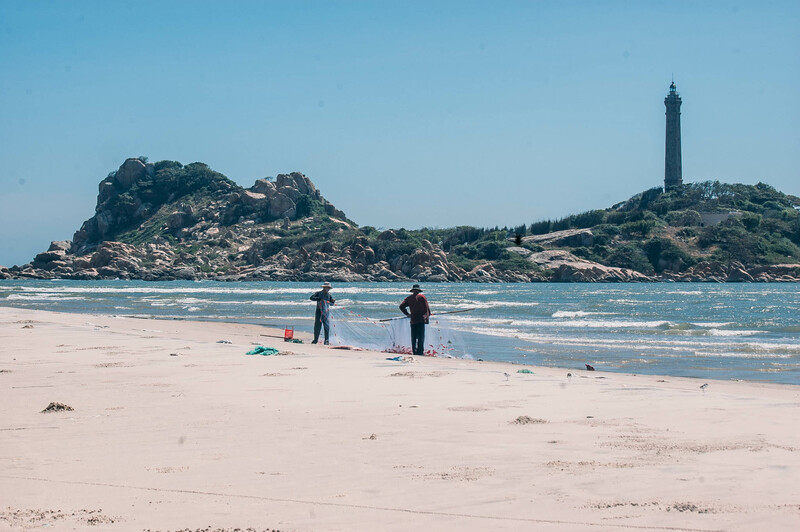 The village is located far east-end of the beach and the best time to visit is early in the morning when fishermen just returned from the sea. You’ll most likely see those hauling fishes, scallops, stingrays and live crabs from their boat while their wives greet them and sell their catch. You can buy fresh seafood here and cook it in your homestay. It’s quite cheap compared to the ones being sold in eateries by the beach. Interestingly, Mui Ne Fishing Village is abundant with round boats made of woven bamboo similar to a floating basin. It is also referred to us woven bamboo basket boat. Most of these boats especially the larger ones operate on diesel or gasoline engine while the smaller ones are typically paddled like canoes. Po Shanu Cham Towers is a temple made up of red bricks crowning a small hill between Mui Ne and Phan Thiet, built to worship the Hindi deity Shiva. There are two surviving tall towers and a smaller building. Don’t expect to find many temples like in Siem Reap because you’ll end up disappointed, rather, treat this as a great opportunity to explore few remnants of the Champa Empire. Also check out the building here where you can find handcrafted souvenirs, colorful textiles, impressive portraits of the locals, etc. From Mui Ne, board the local bus to Phan Thiet for VND 9,000 l PHP 20 (USD 0.40 l EURO 0.34 l SGD 0.54 l MYR 1.62). Get off before border crossing and walk uphill towards the temple. 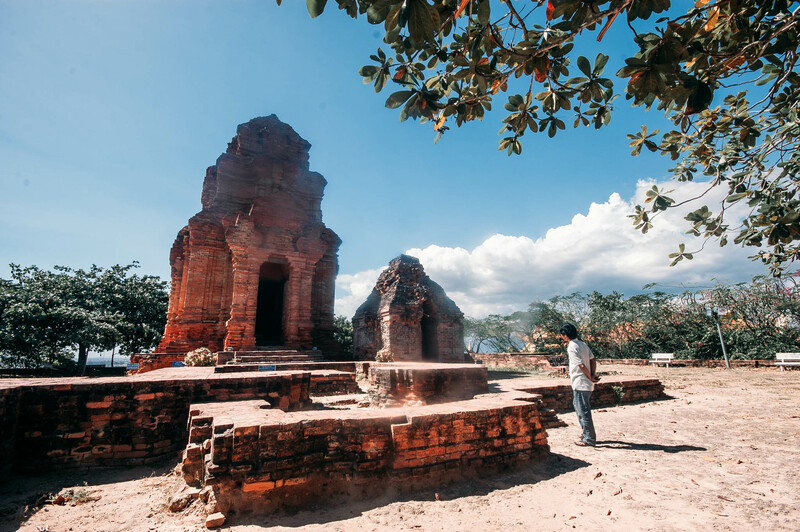 Alternatively, you can join group tours to Phan Thiet, which includes a visit to Po Shanu Cham Towers. 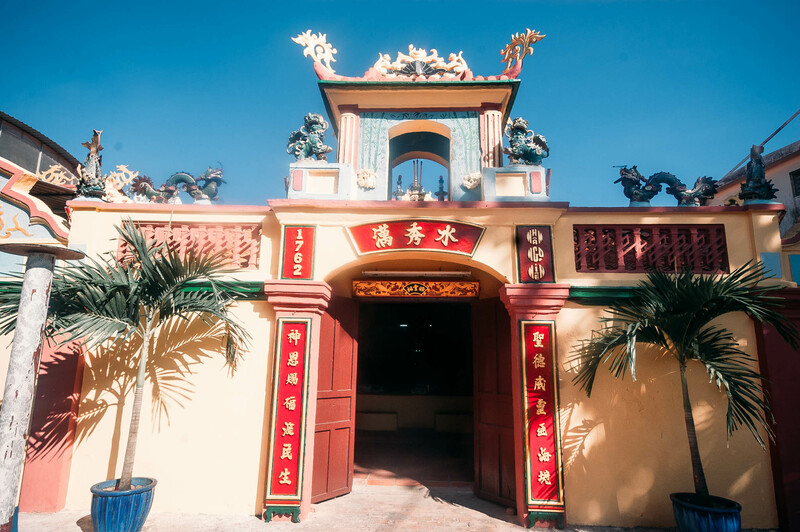 This was my first stop during my Phan Thiet tour – the modest Van Thuy Tu Temple in Phan Thiet. At first sight it looks rather ordinary, but this temple was actually built around 1762 and at the main hall you find the image of Nam Hai, whom the locals worship. Based on anecdotes, there are 24 titles of previous Nguyen Dynasties to be preserved here. But what really piqued my interest is the Whale Museum inside the temple. Here, you’ll find a massive skeleton of a whale. Vietnamese fishermen worship giant whales. They treat them as their guardian angels when they are out there in the sea, fishing. So when the waves are mad or there’s a typhoon or any dangerous events at sea, they pray to the giant whales to keep them safe. It’s a unique religious belief in Vietnam, in fact, the Nghinh Ong Festival (Whale Worshiping Festival) is considered as a National Intangible Cultural Heritage. 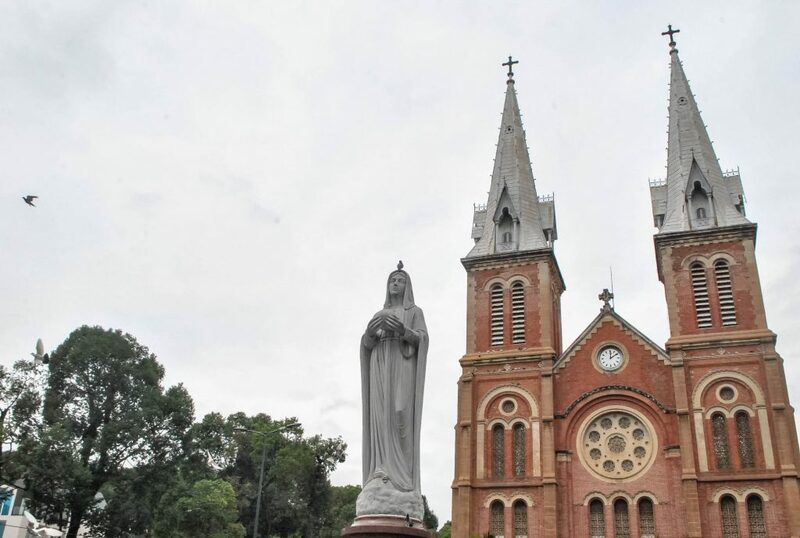 You can attend the festival that is usually held in Can Gio in the coastal town of Can Thanh. The festivity is held on the 14th-16th days of the eighth month of the lunar calendar, around October. Part of the Phan Thiet tours is a visit to the Takou or Ta Cu Mountain. There are two pagodas on top of the mountain here, namely, Linh Son Long Doan and Linh Son Truong Tho, which are surrounded by a dense forest. The temple was built in 1879. 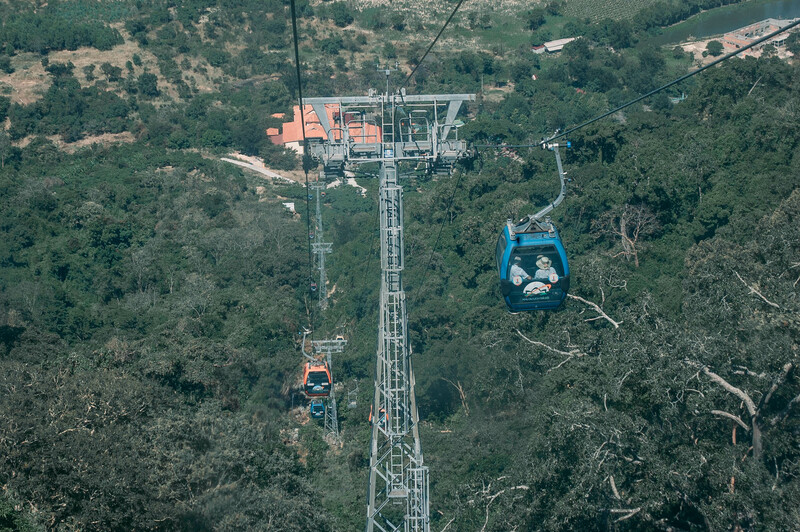 Visitors can ride a cable car to take you to the view point with great views of the surrounding village. There’s a gigantic, white reclining Buddha measuring around 59 meter long and 18 meter high. Souvenirs are also available here and I found a store selling cheap local textiles and handcrafted polo and clothes. About an hour away from Phan Thiet is a beautiful beach with a lighthouse known as Ke Ga Lighthouse. This lonely sentinel standing on a rocky promontory is said to be built sometime in the 1800’s. I really like the beach here, it has powdery cream sand perfect for picnic, quiet and dappled with typical round fishing Vietnamese boat and fishermen doing their daily grind. Binh Thuan Province where Phan Thiet and Mui Ne is located is largely known for its dragon fruits. My driver took me to a dragon farm along the road to Ta Cu Mountain off highway 1A. If you are joining a group tour, many tour operators make a stop here for visitors. 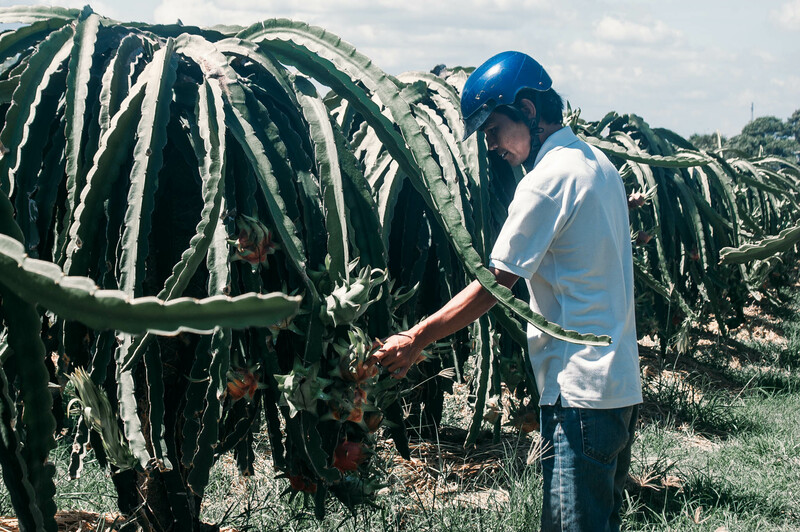 During the dragon fruit season, the highway is also speckled with dragon fruit vendors. Apart from tourism and fishing, this is a thriving livelihood in the province. Mui Ne is one of the best lite surfing spots in Southeast Asia. You’ll find tons of kite surfing school lined up along the beach. You can also try kite boarding and wind surfing here. 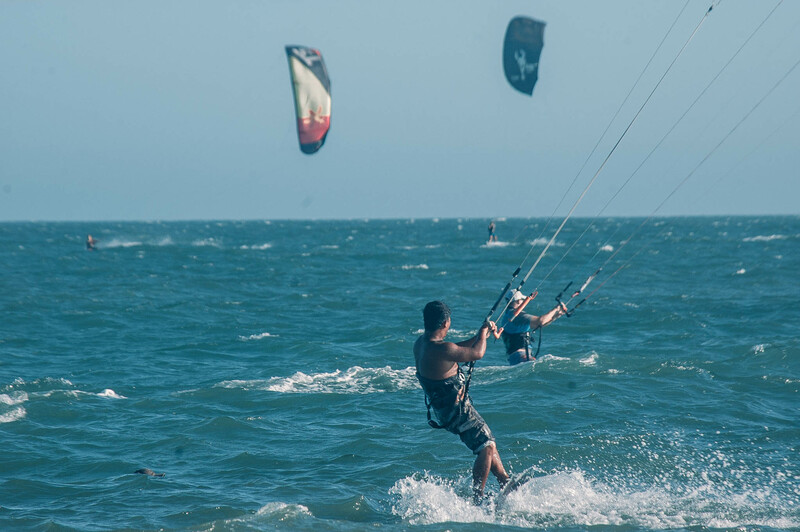 The best season for Mui Ne kitesurfing and other similar water sports is around October to March as the winds are cross on-shore, the ideal condition for beginners. Though I didn’t get to try it myself, my friend’s Swiss fiancé who happened to be in Mui Ne tried it while they were on a holiday. And he said it’s one of the cheapest and best places to learn. 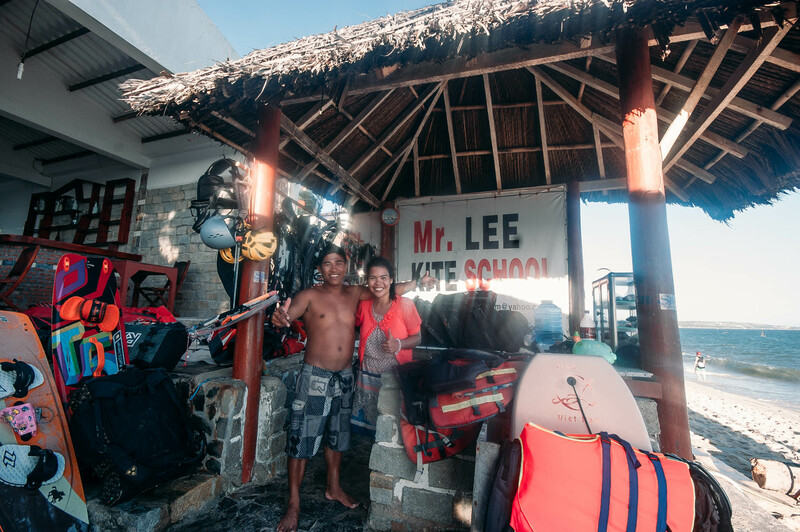 If you are confused where to go, I recommend Mr. Lee Kite Surfing, you can check the reviews on Tripadvisor. I serendipitously met Mr.Lee while I was walking along Mui Ne Beach. He smiled at me when he saw me taking photos of the tourists trying out kite surfing. That time I was still contributing articles for travel and inflight magazines, and I thought of writing a story about Mui Ne Kitesurfing. So I took the opportunity to ask him a few questions and he answered them honestly. He was really friendly and helpful and even his staff, I felt their sincerity and genuine kindness. Kite surfing is an expensive sports because of the hefty equipment. 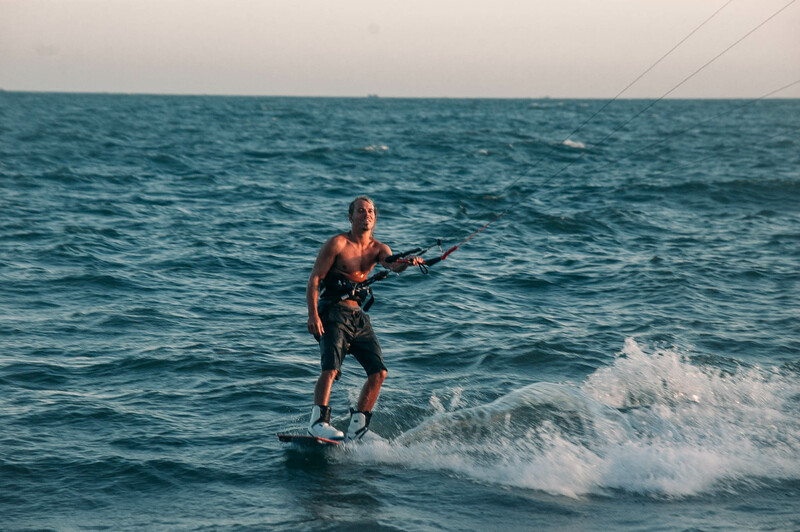 The kite surfing schools in Mui Ne are owned by foreigners, except Mr. Lee Kite Surfing School that’s also one of the reason I recommend you try it to support a local business. Another popular kite surfing school in Mui Ne is C2 Sky Kite Surfing School. While I was in Mui Ne, I contacted C2 Sky Kite Center to interview them regarding kite surfing in Mui Ne. That time I didn’t know my article about Mui Ne was already published on Mabuhay Magazine (Inflight magazine of Philippine Airlines) where I mentioned the Vietnamese cooking class of C2 Sky Center. The staff behind their Facebook page responded immediately and told me that I could drop by and interview Lewis Crathern instead. The famous British kite surfer who was on a world tour and he was in Mui Ne for a Kite Surfing Clinic. But because I was having fun hanging out with my friend Monette, his Swiss fiancé and their friends, I didn’t get to see him. So I decided to just walk along Mui Ne Beach, photograph the kite surfers and that’s how I stumbled upon Mr. Lee. That time, I didn’t know that person I was photographing was already Lewis Crathern. I only learned it was him when I messaged him on his FB page because I noticed he has the same equipment as the guy I photographed. He was kind enough to answer my questions. I learned later on that he was on a coma because of move gone wrong while joining a kite surfing competition. But thankfully, he was such a fighter, he recovered quickly and was able to kite surf again! 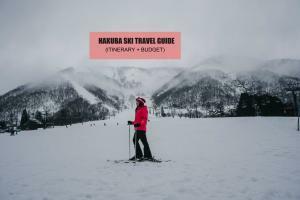 If you follow this itinerary, you can ask your hotel for an extension for a few hours and pay. Or if they won’t allow extension, check out at 12:00 PM and leave your luggage at the hotel while you head to Mui Ne Beach. Make sure you bring your valuables. This is just a sample itinerary, feel free to tweak this. Estimated cost may vary depending on where you stay, what you eat and tour cost. 08:00 PM Arrival in Mui Ne. Check in at hotel. 08:30 PM Look for Mui ne tours and book tour for the next day. 12:00 PM Check out. Leave luggage. 12:30 PM Head to Mui Ne Beach. Swim or watch kite surfers. 01:30 PM Leave Mui Ne Beach. Back to hotel to get luggage and for bus pick up. Here’s a sample itinerary for a 3 days 2 night stay in Mui Ne that covers the top attractions in Mui Ne and Phan Thiet with sample budget breakdown. Feel free to tweak this. ATTRACTIONS: Mui Ne Fishing Village, Mui Ne White Sand Dunes, Fairy Stream , Red Sand Dunes, Whale Temple, Poshanu Cham Tower, Dragon Fruit Farm, Takou Mountain with Cable Car and Ke Ga Light House. 04:00 PM End of tour. Return to Mui Ne. 05:00 PM Freshen up. Rest. If you want a hassle-free tour to Cu Chi Tunnel, you can BOOK A CU CHI TUNNEL TOUR HERE. Tour includes pick up/drop off (hotels in De Tham, Pham Ngu Lao and Bui Vien Street only), English-speaking guide, entrance fee and bottled water. Hi, where did you book Mui Ne sunrise tour?